BUCK’s Multi-Purpose Seasoning– This original blend is as versatile as salt ‘n pepper! Buck’s Seasonings is as versatile as “salt and pepper”, but even you purists will crave the way natural foods burst with flavor when you season with Buck’s Multi-Purpose! Use it alone, mix it with herbs or extra garlic, blend it into your own sauce/gravy/food recipes…while our blends stand out in their own right–used nationwide for chicken BBQs, pig roasts and in restaurants–your own palate will guide your creative use of BUCK’s. Many would argue that this blend made a great thing even better…same recipe as Multi-Purpose, but by mixing with 25% less salt the taste experience is enhanced and the salt base is downplayed. While all 4 blends are pure, high quality dry spice products (don’t worry–no sugar, either! ), 25% Less Salt will convince you that eating healthy can be easier than you thought! Fish, chicken, Thanksgiving turkey, eggs, veggies, prime rib…shake on the Less Salt! Spicier flavors aren’t just a “fad”–many people in many cultures enjoy a zestier taste in foods. 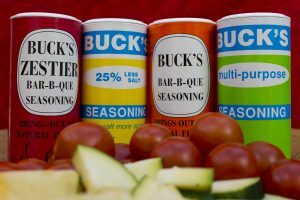 BUCK’s Zestier has enough zing to earn us compliments from our southwestern, Mexican and spice-loving enthusiasts, but no way will you be sweating through this great-tasting blend! Try Zestier on wings, potatoes, eggs, ribs, burgers, POPCORN…anything you enjoy with a little “tang”. The second of BUCK’s original recipes. seasoning blend could find so many fans. If you like to cook on the grill, this is the spice for you.